of Spring, of warmth, of hope, of growth. Not surprisingly, it is a particularly big deal in Russia! Say goodbye to winter with Vodka and pancakes, music and song at the London Maslenitsa Festival a traditional Russian festival to welcome the spring that takes place across London from 19 – 26 February 2012. The London Maslenitsa Festival is the largest celebration of Russian culture, art, music and food anywhere outside Russia. The Maslenitsa celebration is a centuries old Russian tradition that bids farewell to the bitter winter months and welcomes the beginning of the spring. It also marks the last feast before Lent in the Russian Orthodox calendar, when rich foodstuffs must be used up before the Lenten feast; just like Shrove Tuesday in the UK, the traditional Maslenitsa meal is a Pancake but served with a Russian twist: instead of the usual lemon and sugar, Maslenitsa pancakes, or Blinis are served with Caviar and Vodka. The London Maslenitsa Festival will bring venues across the city to life with a week of performances, food, exhibitions and events that will transport this important celebration of Russian culture to the heart of London. Highlights include a fashion show from leading and up-and-coming Russian designers at the Victoria and Albert Museum, a children’s production performed by the renowned Moscow State Gogol Theatre at Shaftesbury Theatre, and master-classes with celebrity Russian Chefs exploring authentic Russian cuisine, including the quintessential Maslenitsa delicacy: the Blini. 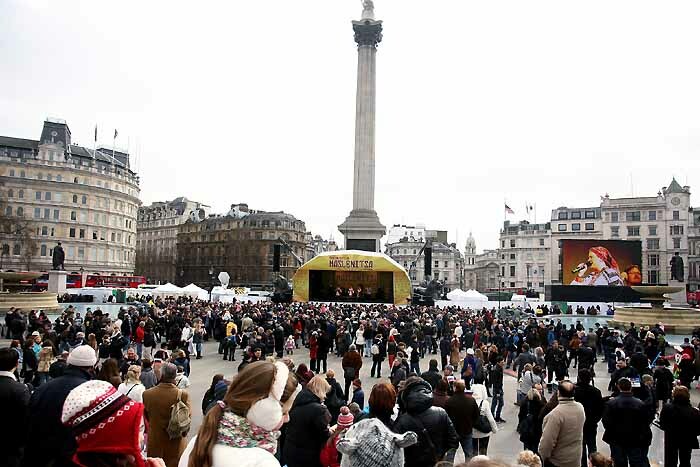 The events build to the climax of the Festival, 26 February - the day of Maslenitsa itself - when Trafalgar Square will be transformed into a bustling bazaar offering traditional Russian foods, handicrafts and souvenirs and original art from contemporary Russian artists. At the same time performances from some of Russia’s most acclaimed dance, theatre, folk, pop and jazz artists will entertain the audience from the Festival’s main stage. Entrance is FREE. London’s Maslenitsa Festival takes place at the same time as Maslenitsa festivals across Russia including Moscow’s Red Square. Londoners will able to exchange traditional Russian Maslenitsa greetings with Muscovites via giant video screens that will connect both Festivals taking place a thousand miles apart. Maslenitsa is traditionally a family event, and its London cousin will be no different, with a children's marquee programme featuring exclusive performances by the award winning Theatre Chudaki, a presentation of Maslenitsa traditions, with audience interaction, performances of traditional songs by children's groups and plenty of competitions, games and fun. No celebration would be complete without music and the richness and diversity of Russia's musical heritage will laid out in a buzzing programme, direct from Russia of dance, theatre and folk, pop and jazz music.. Sample your way around a marketplace of authentic Russian dishes, ranging from the staples of beef stroganoff and borscht (beetroot soup) to such regional delicacies as pelmeni (Russian-style pasta), traditional Russian pastries (bubliki and vatrushki) and, of course, the quintessential Maslenitsa delicacy: blini (pancakes)..
Trafalgar Square will be transformed into a bustling bazaar exhibiting and selling original Russian Art, handicrafts and souvenirs, ranging from the traditional to the contemporary..
Tell winter where to get off and say "Zdravstvui Maslenitsa!" to Spring as only the Russians can! Russian people love to party so grab a drink and a blini and join in the fun. You won't be disapointed.. Anybody going on Sunday to London?